The next stop on our big adventure this summer was Stockholm. 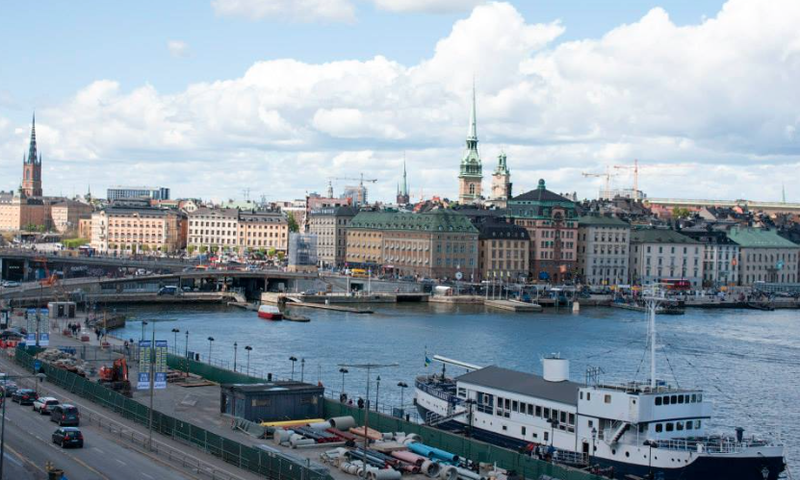 We both agreed that Stockholm was probably our favorite of the three places we went. It was so beautiful and clean and not insanely crowded. I didn’t really know what to expect from Stockholm but I had heard great things, and it did not disappoint. If anything, the only thing I didn’t like was that I didn’t get enough time to explore everything….and the fact that is quite expensive. While we tried to keep our meals as budget-friendly as possibly, we did find it a lot more difficult to find cheaper options. However, we did have some amazing meals. I’m not even going to try to pronounce the name of this restaurant, but we went three times. It wasn’t super cheap but it wasn’t crazy expensive either, and the atmosphere was just amazing. It is right on the water in Kungsholmen and is all outside. There’s an area with picnic-type tables, a large gazebo, and even an area that floats out over the water. They also sold all types of plants and ceramic and things I wanted to buy. After double checking the name on Google I did find that it is a summer-only cafe, so if you want to go you have to go in the summer…although I would imagine that’s the best time to go to Stockholm anyways. Moving on to the food, this was my first Swedish meatball experience! Now I have to attempt to talk about meatballs without creating a “that’s what she said” moment. So for this meal I got probably about 10 small meatballs, mashed potatoes, cucumbers, and lingonberries with gravy on top. It was soooo delicious. Sam got a halloumi burger, which is an actual burger made out of cheese instead of beef. Needless to say he liked it. The other two times we went for dessert and got some delicious pie and cinnamon rolls. The food was really good but the atmosphere is what made us come back every night. The next night we ate more Swedish meatballs at a restaurant called Pelikan. I went here on the request of Essie Button’s Scandinavia vlogs. 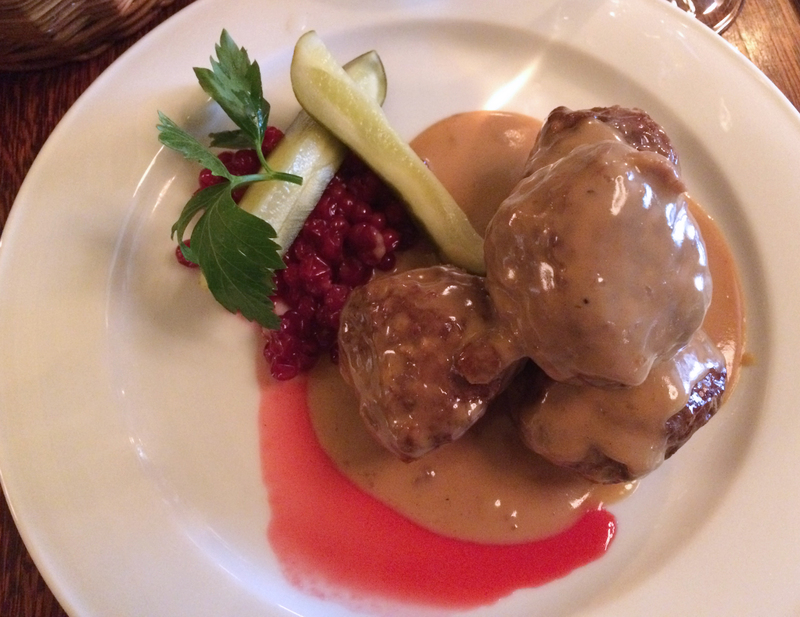 Yelp also agreed that this was probably the best Swedish meatballs in Stockholm. These were a little different from the pervious night as they were much larger and we only got four. I could barely finish them though. Again they came with lingonberries and pickles, and we also got a side of mashed potatoes. I have to say, I think these were better than the last ones. They were just cooked so perfectly and the gravy was amazing as well. This was a little bit of a fancier atmosphere, and I think it was probably our most expensive meal, but it still wasn’t crazy. They also have a ton of other traditional Swedish meals on the menu. Sam was going to get the reindeer but that was insanely expensive. I would definitely suggest coming here if you’re looking for a really traditional Swedish meal. We stumbled across this restaurant when we sadly were unable to go to Herman’s because it was closed for renovation. We figured we might as well try pizza everywhere we went, so we chose to try it for lunch on this day. Unfortunately they didn’t have an English menu and none of the staff could speak good enough English to tell us what things meant, which is kind of surprising for Stockholm. But anyways, we just kind of guessed and ended up with what is pictured above. 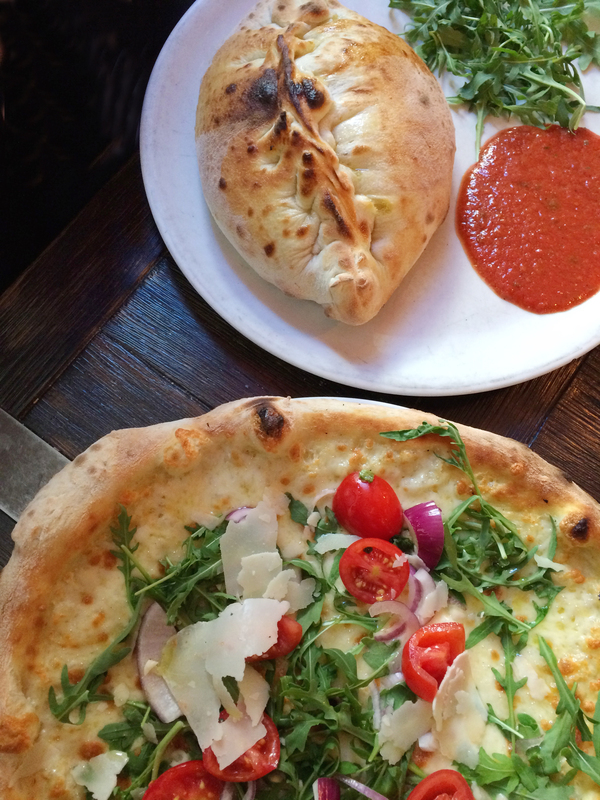 My pizza just had cheese, tomatoes, rocket, and red onion and Sam got a cheese calzone. It was all brick oven pizza and we watched them make it right before they brought it out, so it was really nice and fresh. Overall it was pretty good, but I kind of wish I could’ve read the menu to chose a more exciting pizza… but hey that’s part of being in another country right? While this picture might not look that appealing, I really loved this place. 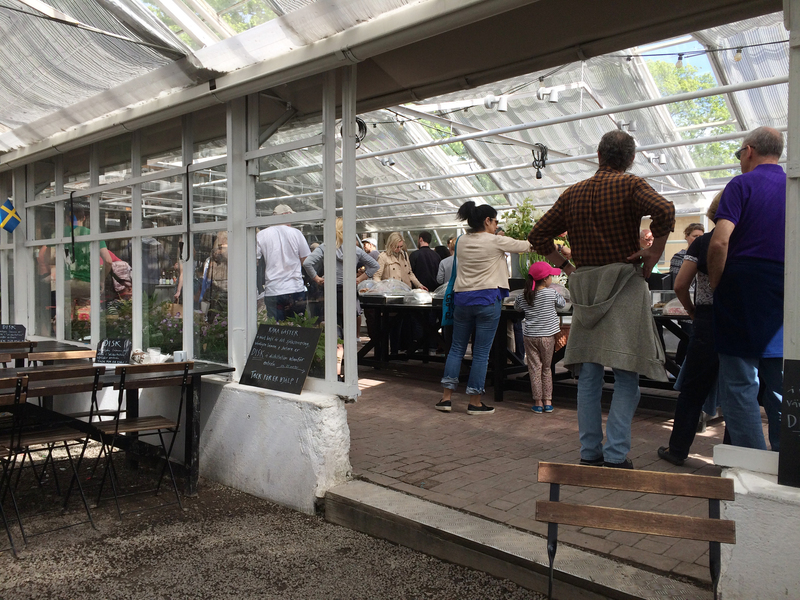 It’s situated in a little green house in the middle of a park in Djurgarden. My favorite part about this place is that it seemed to be centered around the dessert, which is my kind of place. As you walk in there is a fairly large buffet full of cookies, cakes, and pies. Each item has a price next to it and you can grab all you want. At the end of the bar there were a few sandwich options as well. They did have daily specials for entrees, but again, they didn’t have an English menu, so we just grabbed a half of a sandwich each and a bunch of cookies. For some reason I only took photos of two cookies, but believe me there were many more. The atmosphere here was just lovely and I could’ve sat there all day. 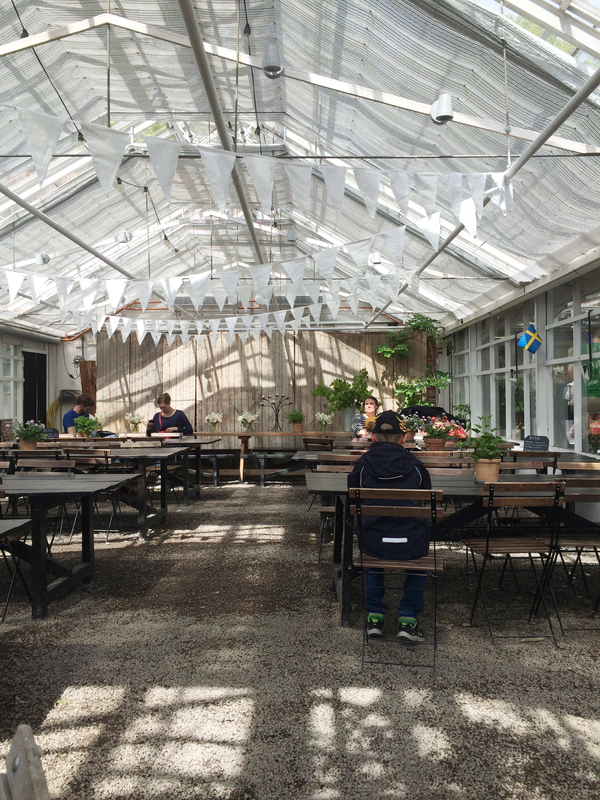 They had seating inside the greenhouse, as well as outside. They also had a nice little store where they sold things like fresh made jam and honey. 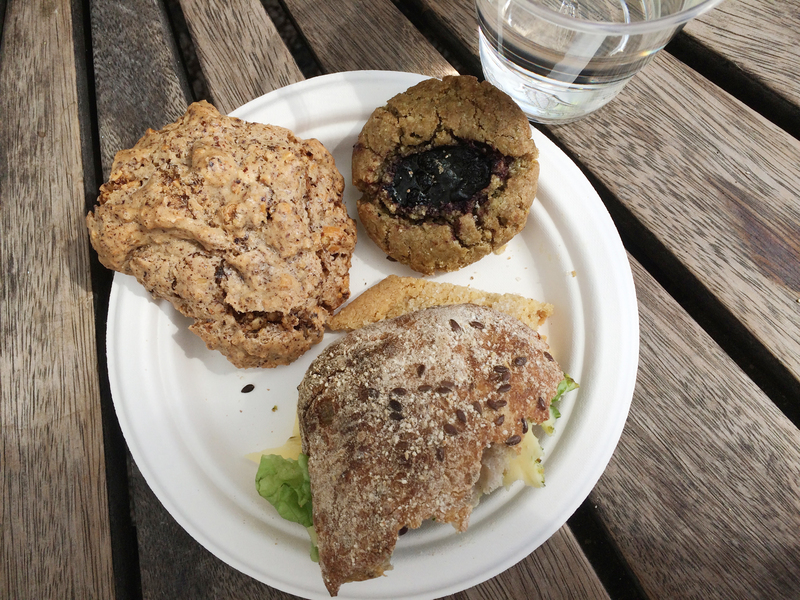 And that is all of the delicious things I ate in Stockholm. We also made a few trips to 7-11 for breakfast to save some money, but I don’t think you’re interested in seeing that. Stockholm was such a beautiful city and I can’t wait to go back one day. Let me know if you’d like me to do some more travel-focused posts on actual travel tips rather than food as well.